Circumstances surrounding an unexplained spike in deaths among homeless men have Tony Marcella suspecting paranormal forces are again at work in the town of New Castle. But things get complicated when his investigation is stifled by his hopeless infatuation with a witch who just may be at the heart of the mystery. Dana has stumbled upon the perfect Witches Brew (yes, I went there) of words. I’m under his spell in this third book of the Detective Marcella Witch’s Series. His characters, plot, landscape descriptions are so well-written that one feels submerged in the plot, standing right beside Tony and Lilith. Taking cues from the Bible, literature and popular culture, Dana weaves and bobs his way around words, phrases and stake-outs to bring to life the mystery of Lilith and another mysterious witch, Ursula. Tony finds himself face to face with his past at a train-wreck speed that threatens to run him over. He hops on one mystery after another, where he and his former detectives find a serial killer that is targeting young men in hobo camps. Is it someone with a grudge against the young usurpers or a deeper mystery at play? Tony and the gang are finding Witch’s clues that culminates to a spellbinding ending! 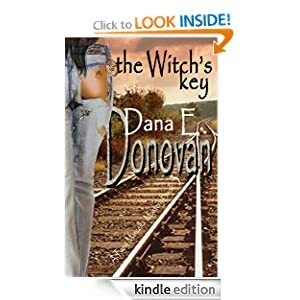 I thoroughly enjoyed Dana’s third book in his series and am looking forward to the next book to see what Tony, Lilith and his cohorts are up to. From one Mystery Writer to another, Dana, keep up the good work! I would give The Witches Key 4.5 stars!